Every one of us has a field of expertise. When we used to study in schools, we were expert in some subjects. While performance in other subjects used to be critical. So we used to take help of tutors in those subjects. As we grow, we focus more on new and professional subjects. And our old expertise remains of no use. But do you know, you can earn money tutoring at InstaEdu to get the best use of your old expertise. With the technology on its high, and the world getting digital. Online learning and tutoring have replaced the traditional ways. Now, students and teachers are just a single click apart from each other. Such revolution has not only provided students a convenient and easy way of learning. But also at the same time, teachers have got an opportunity to earn money tutoring. Just from the comfort of their home. In this post, I’m going to discuss one such online portal – InstaEdu. You can earn money tutoring at InstaEdu up to $20/hour. After reading this post, you would come to know that how can you earn money tutoring at InstaEdu. Who can Earn Money Tutoring at InstaEdu? How to Earn Money Tutoring at InstaEdu? Why is it Great Idea to Earn Money Tutoring at InstaEdu? InstaEdu is a knowledge sharing online portal where tutors and students connect each other to help each other cause. It claims to be world’s top online tutoring service. InstaEdu was founded by three entrepreneurs in 2011. Those entrepreneurs are Alison Johnston Rue, Dan Johnston, and Joey Shurtleff. You can see and learn more about InstaEdu from their about us page. Any one who is at least 18 years old and having a Facebook account, can join and earn. Yes, Facebook account! 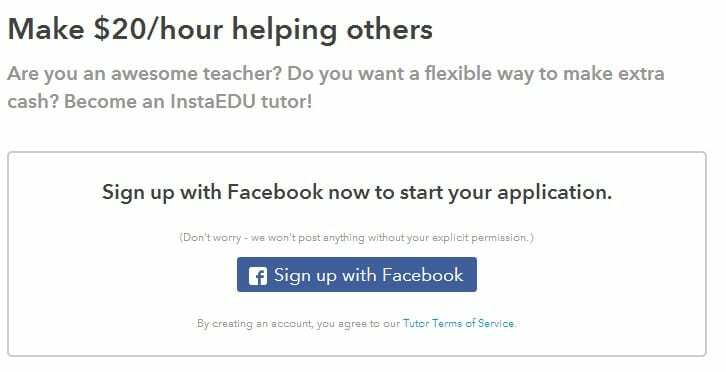 Currently, they only offer tutors to sign up using their Facebook account. This is mandatory as to verify your age and schooling or other academic details. It is also clearly listed that you must be at least enrolled in any graduate program. However, graduated from any college are preferred. You can see more from their FAQ page. First of all, go to the link Become a Tutor. And sign up using your Facebook account. Fill other basic details and contact information. Select your field(s) of expertise or subject(s) of interest that you would be tutoring. Provide a brief bio about yourself including your previous tutoring experiences(if any). And finally, submit the application. Once submitted, your request and information would be reviewed. If you fit for the InstaEdu, you’ll be selected. And your profile will be listed on the portal. Thus you would start tutoring. The best thing about InstaEdu is you can set your hours to tutor. Also if you are busy or don’t want to tutor for some days or weeks, you can choose to not tutor at all. One more thing that makes it interesting to earn money tutoring at InstaEdu is its paying. Whether you teach 1 minute or 60 minutes – you would be getting same $20. Though for the 61st minute, the earning changes and is counted in 2nd hour ($20+$20=$40). So never mind if your tutoring session got disconnected within 10 minutes of the start. You would still be getting full wages. However, keep in mind the minimum time length of tutoring session to choose is 5 minutes. Though, it takes about a week to clear your payment. You can choose to get paid via PayPal or direct deposit. But just consider the higher per hour wage. It is a great idea to earn money tutoring at InstaEdu. If you are passionate about teaching, you can make huge money teaching at InstaEdu. But make sure you are a skilled person. Otherwise, you will find it very difficult to get any student. However, traffic of students at InstaEdu is very high. So you would not have to waste time without tutoring. Like the other portals where getting students is tough. On average, tutors at InstaEdu earn up to $ 75 per week. But many pros – experts are earning over $1500 per month. And more importantly, just for helping needy students. And needy one is that who is in that situation in which we used to be a few years back. It is a great feeling to help someone. But just consider the amount of money you would be getting. It’s not a bad deal to help others as well as sharpen your skill. Also, consider sharing this and help others earn money tutoring at InstaEdu. Because Sharing is Caring ! Do you like tutoring? How has it been your experience with InstaEdu so far? Do let me know in the comment section below. It is amazing tutorials for all. It is a very wonderful post. Previous: How to Find High-Quality Free Blog Images Using Flickr?